E-commerce is an important or the vital part of World Wide Web. It allows you to manage the business or expand the organization across the globe with minimum capital investment. Lots of work is reduced as it will manage all your paper based information by simply digitizing the information. It helps to provide with a better customer service and saves time. It allows creating online shops for different products. This will yield a better productivity for both companies and product. WooCommerce is a free eCommerce plugin that will help to turn your WordPress site into a full-featured online store. It helps to mange payments, shipping and inventory in a better way. WooCommerce product slider allows showcasing the product in a sliding and attractive manner. The main purpose to have a slider is to represent the content in such a manner so that the customers can relate, which gives them the quick view to see the highlights and take a quick action. There are many slider plugins that are available in the market that will guarantee you with many features. But most of them are non responsive slider that will break or ruin your sites layout on different devices. Also the plugins that are available are either bulky or buggy. All these disadvantages can be overcome by SliderVilla which offers responsive, simple and bug free sliders. WooCommerce Slider will show all your products which you have created in WooCommerce’s post. Ones the plugin is activated you will find the WooCommerce option in the admin panel where the settings related to it can done. NOTE: If the plugin is not activated then WooCommerce option will not get appeared for the Admin panel. Also it will not appear on create new page of the slider. Depending upon the choice that is made, fill in the details for the WooCommerce Slider. It consists of fields such as name of the Slider, type if the Slider and Category of the Slider. All these fields are self explanatory. Step 3] Select the Skin and Layout for the Slider. An Easy builder will get appeared for the same where one can change all types of settings as per the requirements. There will be the additional menus Eshop for setting. One will be able to customize Add to cart button, Sale strip, Regular price and many more from here. 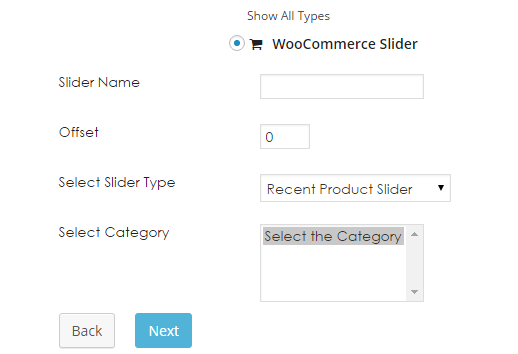 One is able to implement the WooCommerce Slider in SliderVilla by following the 3 simple steps. It allows selecting different slider type as per the requirements. The particular slider type can be selected as per the requirement. One can even customize Add to cart button and the star ratings from E-shop settings. One is able to select the Skin and different layouts for the Slider. There are about 6 Layouts that are present from which the choice can be made. One is able to make the additional settings besides basic settings that are provided for the WooCommerce using the E-shop menus for formatting. There will be shortcode or template tag to display it on the front end. One can also insert the Slider widget on any of the active widget of your theme. All the sliders that are provided in SliderVilla are the responsive sliders they will not ruin or break the layout of the site. The sliders that are provided are bug free and not bulky. They are simple and easy to understand. There is a great saying by Dalton McGuinty, “There’s no wrong time to make the right decision.” Considering the entire features one should make the choice for the best slider that will suit your needs and requirements.